An infestation of rodents in your home can be disastrous, as they can cause costly damage to the structure of the house and also bring the possibility of spreading disease to you, your family, or your pets. It pays to be able to identify the early signs of an infestation—if you are able to call pest control services to eradicate the rodents before the infestation is full-blown, you will save yourself time, money, and stress in dealing with the problem. Here we’ll take a look at some of the telltale signs that rodents might be taking up residence in your home. While this may sound obvious, seeing rats, mice, or other rodents scurrying around your home means there is a high probability that your house is infested. Rodents are typically most active at night, so crossing paths with one during the daytime likely means there many others back at the nest and its starting to get a bit crowded in there. 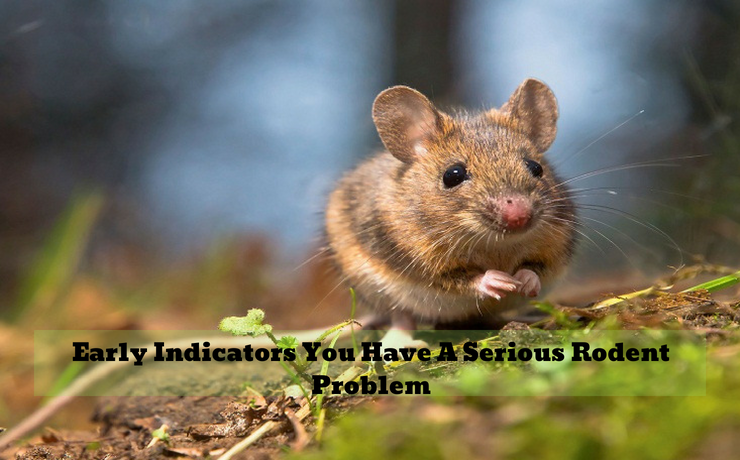 Seeing a single rodent in your home doesn’t always mean there is an infestation, however, it should certainly put you on high alert to be on the lookout for signs that there are more unwanted critters about. You may also wish to look into calling a residential pest control company in Sydney to have a closer look and to assess the situation. 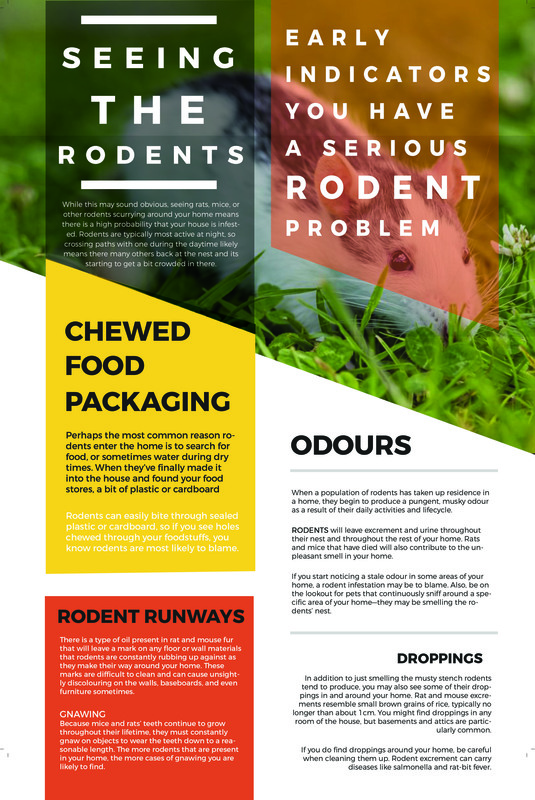 When a population of rodents has taken up residence in a home, they begin to produce a pungent, musky odour as a result of their daily activities and lifecycle. Rodents will leave excrement and urine throughout their nest and throughout the rest of your home. Rats and mice that have died will also contribute to the unpleasant smell in your home. If you start noticing a stale odour in some areas of your home, a rodent infestation may be to blame. Also, be on the lookout for pets that continuously sniff around a specific area of your home—they may be smelling the rodents’ nest. In addition to just smelling the musty stench rodents tend to produce, you may also see some of their droppings in and around your home. Rat and mouse excrements resemble small brown grains of rice, typically no longer than about 1cm. You might find droppings in any room of the house, but basements and attics are particularly common. If you do find droppings around your home, be careful when cleaning them up. Rodent excrement can carry diseases like salmonella and rat-bit fever. Perhaps the most common reason rodents enter the home is to search for food, or sometimes water during dry times. When they’ve finally made it into the house and found your food stores, a bit of plastic or cardboard packaging isn’t going to stop them from feasting. Rodents can easily bite through sealed plastic or cardboard, so if you see holes chewed through your foodstuffs, you know rodents are most likely to blame. Anything rodents bite through should be tossed out immediately, as there are several health risks that go along with food that has been tampered with by them. If you suspect you may have rodents in your home, check over every bit of food in your pantry. It’s especially important to check pet food bags, as they are common targets for rodents. If you see any food that with wrapping that has been chewed or ripped open, throw it away immediately. There is a type of oil present in rat and mouse fur that will leave a mark on any floor or wall materials that rodents are constantly rubbing up against as they make their way around your home. These marks are difficult to clean and can cause unsightly discolouring on the walls, baseboards, and even furniture sometimes. As you check your home for signs of rodents, be on the lookout for these discoloured “rodent runways” especially if you also see holes or tears in the walls or baseboards where rodents may be entering and exiting a room. Because mice and rats’ teeth continue to grow throughout their lifetime, they must constantly gnaw on objects to wear the teeth down to a reasonable length. The more rodents that are present in your home, the more cases of gnawing you are likely to find. Common things rodents will gnaw on include wooden furniture, wires, cardboard, and insulation. Rodents may also sometimes enter your house looking for water, so check for gnawing around water pipes as well. Rodents tend to be very quick and agile creatures, meaning that you may hear them scurrying or scratching in your walls, especially at night. If you have a pet that gets agitated during the night, it could be because the pet is hearing the rodent noises from inside the wall. If you are hearing scurrying noises throughout the day, it likely means that the nest is full, forcing some rodents to go out and roam around until there is space for the again—a sure early sign of an infestation. ← Previous Previous post: What Kind Of Warranty Should A New Roof Have?